Interview with Tanner Richard! | Not Your Average Hockey Blog. Like usual, we are in bold. Well, seeing how I’m laying in bed sick and have been since Friday night, my day has been kind of miserable. It’s frustrating having to lay here in bed and not be able to do anything. Missing 2 practices and a big game makes it even worse. So many of our readers might not know who you are, so a little bit about yourself? Maybe a cool fact? Hmm.. Well I’m a Swiss kid playing hockey in Canada just trying to make it to the big leagues and live the dream. Cool fact, I speak 4 languages. English, German, pretty good French, and then Italian. Italian I understand a fair amount, but my speaking level I’m still working on. I would say I am a playmaker and I think my stats form the past would say the same. Although lately I have found a bit of a scoring touch. I hope to keep up both parts now. Was hockey your only sport that you played growing up? No. Growing up in Switzerland where soccer is the country’s first sport, it’s kind of like hockey here. Almost every kid tries hockey, well there it’s vice versa. I played soccer for a few years but decided to stick to hockey. So many players that I interview don’t go through the OHL, instead, they go through other junior leagues like the WHL and NCAA. So what’s the OHL like? I don’t know too much about the NCAA, I mean I’ve gotten the chance to talk to some guys but don’t know too much. I would say the OHL is a bit similar to the WHL. After all, they’re both in the CHL. The main difference I would have to say is the travelling though. I have a few buddies in the WHL and they travel a lot more than we do. They go on like 2 week road trips and stuff and have beds in their team bus, we don’t have that. Some of the OHL teams I think have a few bigger road trips than we do in Guelph, that’s because we’re located really well. Our longest road trip this season was 4 days. In those 4 days we played in Peterborough-Ottawa and Kingston. Take us back to the Draft. What happened, your emotions and emotions? The Draft is definitely one of the highlights of my life so far. Just being at an event like that is something I’ll take with me through my whole life, be able to tell my children about and just never forget. Not just the getting drafted part, but just being at an NHL event like that, I remember on the morning of the first draft day we had a meeting and players like Brendan Shanahan, Mathieu Schneider, and Ryan Nugent Hopkins were there. They just shared some stories and talked about what to expect. And than once you get drafted you get welcomed by the whole staff of the organization. It felt amazing to be welcomed as a new member of the organization and still now is highly motivating to get to the next level. Being able to share the experience with my family and a few relatives and close friends, made it that much better. What’s it like in the off-season? I don’t know how it is here in the off season. But for me, in the off season I go back home to Rapperswil, Switzerland- my hometown. I train with the pro team there. Back home, as a player you are obligated to do the off season training as a team, it’s not individual like here. We have 2 training sessions a day. One is usually for strength, and than the other will be balance, cardio, skills development or something like that. Summer is really tough, but that’s where you get to be a better player than you were the season before. You can work on your puckhandling skills, your skating, your strength, your shot.. So many things! For sure my family and friends. Here after the weekend games we usually get one day off or so so a lot of the guys go home and still can spend time with their family and friends, but for me that’s not really the case. I’m fortunate enough though, to have my mom, my brother and my father come over once per season for a week and a half. All at separate times so I really value that time I get to spend with them. So you represented Switzerland during the 2012 WJHC, what was that like? The WJC12 in Calgary was the highlight of my hockey career to this day. It was so amazing. Being able to play in the Saddledome in front of a sold out hockey crazy crowd was breathtaking. Being the underdog, and the fact that Canada has rivalries with Sweden and especially Russia, the fans cheered their hardest for us. I remember a few times where I got goosebumps when the crowd would cheer “Go Swiss Go” or when we would score a goal and the place went nuts. What has been your highest point of you career so far? Scoring the OT winner for Switzerland at the WJC12 in relegation round against Denmark to keep our team from getting relegated. Losing to Russia in the quarterfinal game in Ufa at the WJC13. Losing to Russia in that game after a shootout was the most heart breaking hockey moment of my career. When you want something so bad, and you’re so close to success but than it all turns around and you lose, that really destroys you. We were ahead 3-2 and than they tied it up with 90 seconds to go. We than had a few good chances in OT and could have just as well beaten them in the shootout, except we didn’t. 90 seconds away from advancing to the semi finals and we would have been guaranteed to play for a medal. I’m sure for a Canadian that’s normal, but as a Swiss player being that close to a medal, you don’t have those opportunities all that often. Also the fact knowing this was my last shot with the junior National team, made it a bit worse because there’s no shot at it next year. For many of the guys there will be, but not for me, I’m too old now, my time is up. I love a great steak, but being form Europe and being so close to the Italian border I’m fortunate enough to be able to eat some of the best Spaghetti and Pizza in the world. The last few months I’ve really been listening to a lot of Drake, I’d love to see a concert of his some day. Every hockey team does pranks. What’s the best you’ve seen or were part of? Other than that just little things in the room, shaving cream in one of the player’s pockets. Cutting up a guys skate laces, hiding their sticks. On road trips the big thing is to lean water buckets on top of the door so when you open the door it spills all over you. Unfortunately that ended up ruining one of the guy’s laptop this year.Also tornadoing guys’ hotel rooms and hiding the mattresses outside or on the balcony and stuff like that. All just little things that are in good healthy fun. I usually don’t take part in that kind of stuff though, I’ll more often just sit back and laugh at the guy who got pranked! Subject you hated most in school? Science, I was terrible. Every class it would just be a battle to get through the lesson. Last question. Any advice for aspiring hockey players? -Work harder than the guy next to you. Hockey doesn’t owe you anything, but you still get a chance, make the most of it. -Have fun, play every shift like it’s your last and get better every day. 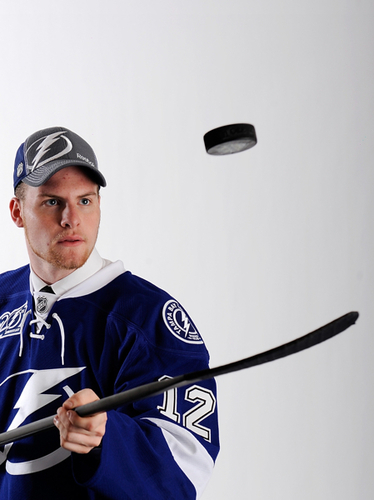 This entry was posted in Uncategorized and tagged Interview, NHL, OHL, Tampa Bay Lightning. Bookmark the permalink.